“I solemnly swear that I am up to no good.” Just recite the phrase and tap your wand to learn the location of every inch of Hogwarts. Here, we offer a slightly different brand of magic. 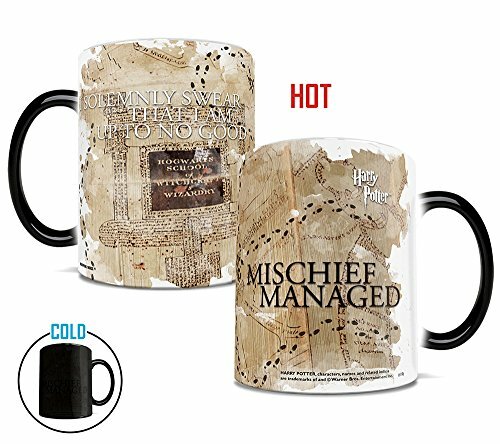 The exterior of this Morphing Mugs heat-sensitive, color changing mug transforms from black as hot liquid is added to reveal a full color image of the Marauder’s Map, along with the two magic phrases made for its use. Whatever you’re up to, this mug (and your morning coffee) will help insure that your mischief stays 100% managed. If you have any questions about this product by Morphing Mugs, contact us by completing and submitting the form below. If you are looking for a specif part number, please include it with your message.